Get caught up in the Fireworks Frenzy Slot! Spin through expanding wild wheels, Firecracker scatters and exciting Free spins features to multiply your wins & unlock flaming jackpot riches! 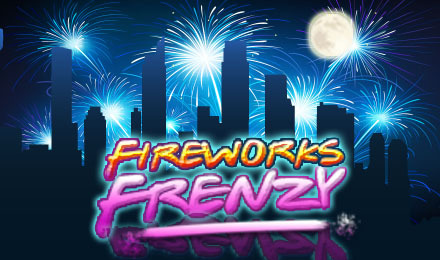 Fireworks Frenzy offers 5 reels and 25 pay lines of fire-blasting slot entertainment. The sparky reels are bursting at the seams with flaming symbols, expanding wilds, scatters, Free spins and a fiery jackpot waiting to explode. If the wild Spinning Wheel symbol blasts onto the reels, you can triple your payout. If 5 awesome Firecracker scatter symbols bound onto the game, you can win 300 x your line bet plus 25 free spins! Once you activate the Free Spins feature, the wild spinning wheel symbols can also expand across the wheel to triple your riches!